Whether you’re a gaming enthusiast or a high-end system builder, you can count on the performance and reliability of the G.SKILL RipjawsX Series DDR3 memory kit. 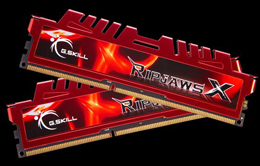 The G.SKILL RipjawsX Series DDR3 memory kit is specially designed to complement dual-channel capable systems. It is tested under G.SKILL’s rigorous testing process to ensure the best performance, compatibility, and stability on both AMD and Intel systems. It delivers optimum speed and low latency, thus helping efficiently address the demanding needs in work and entertainment. And, it supports XMP 2.0 profiles for trouble-free automatic overclocking. The stylish heat spreader not only provides superior cooling efficiency, but also lets you show off your rig in style. Enthusiasts' choice can't be wrong. 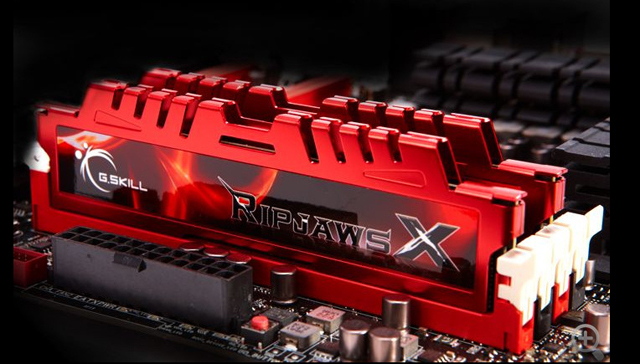 Building on the world-class performance and overclockability, G.SKILL Ripjaws X series DDR3 memory has been voted as the Best Memory Series by the community of the overclockers in 2011! If you need a high performance and high quality kit to complete your enthusiast PC, look no further. 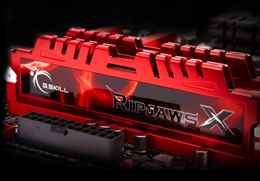 Unparalleled DDR3 memory solution, the Ripjaws X Series is the memory of choice. 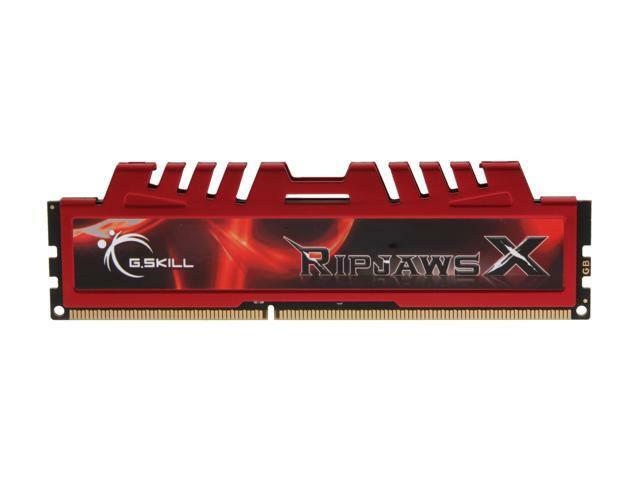 Specifically designed to complement dual-channel capable systems and optimized for the widest compatibility with Intel and AMD platforms, each Ripjaws X memory kit is put through numerous compatibility and stress tests. As a result of the strict quality control, RipjawsX offers the highest quality, fastest speed, lowest timing, and firmest stability. Sporting a sleek and stylish heat spreader, heat dissipation is maximized by increasing surface area for cool air to pass over while your system is gaming or computing. The hollow teeth-like heat spreader fins is made from aluminum and designed to allow maximum air flow for maximum cooling efficiency. Pros: Great RAM. I use it for gaming, video editing & multitasking. Good to hear the memory kit is working great in your system. A higher frequency and more memory capacity can surely enhance gaming, video editing, and multi-tasking. With regards to slow shipping, please contact NewEgg directly for assistance. They can provide status and information regarding return delivery. This is a high performance memory kit so we are certain you will be very pleased with the results. For any questions or concerns about the product itself, please don't hesitate to contact us directly. Cons: mobo and windows see's ram as 1333mhz, have to do alot of research and go into bios and overclock and set latency and other settings to get mobo and windows to see 1866mhz.. that's mis rep of your product, if you are going to market this as 1866 then mobo and windows should see 1866 out of the box.. I should not have to change a thing in bios.. its a pain. Thank you for your G.Skill purchase and review. Good to hear the memory has been working well in your system. DRAM/system memory does not come pre-overclocked like a GPU. 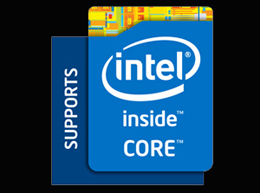 If a frequency is supported by the motherboard and CPU, it is up to the user to manually set up or enable the XMP Profile in BIOS. Without doing so, the RAM will AUTO default boot up to a standard value such as DDR3-1333. For a guide on how to set up BIOS, click on the link below. Should you need further assistance, please don't hesitate to contact us directly. and we will make sure your computer is operating at maximum performance. Pros: Installed into a Asus pc for test purposes and worked out fine as DDR3 1866. My thumb tips can press these safely into the slots. with better ram and processor as well as an M.2 Drive. The upgrades never stop and will always be with us till we wake up! Pros: - Ram just doin' its job. It does its job well. Other Thoughts: Excellent product. I don't know what else to say. It is ram and it does its job well. I would recommend buying it. I just bought a second stick today and I intend to fill up all my slot.